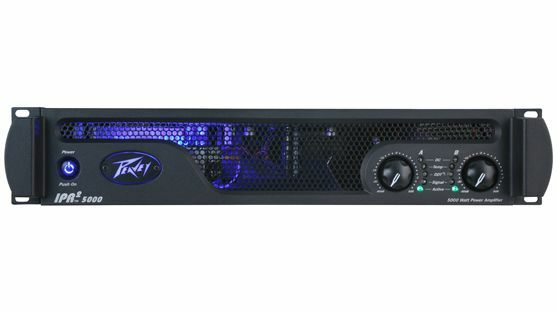 The Peavey IPR2 power amplifiers are designed for years of reliable, flawless operation under rigorous use! This groundbreaking series utilizes an advanced design that reduces weight while increasing output power, reliability, and cooling systems. They are designed with a high-speed class D topology that yields the highest audio resolution and efficiency available. The DDT™ (Distortion Detection Technique) circuitry ensures trouble-free operation into loads as low as 2 ohms. The IPR Series is available with or without DSP (digital signal processor). They are also available in 4 different watts. Rated Watts 2ch x 2 ohms 3230 watts 20ms repetitive burst / 2530 watts 1% THD both channels driven @ 1kHz. Rated Watts 2ch x 4 ohms 1985 watts 20ms repetitive burst / 1700 watts 1% THD / 1470 watts 0.15% THD, both channels driven @ 1kHz. Rated Watts 2ch x 8 ohms 1175 watts 20ms repetitive burst / 1025 watts 1% THD / 880 watts 0.15% THD, both channels driven @ 1kHz. Rated Watts 2ch x 2 ohms 4750 watts 20ms repetitive burst / 3750 watts 1% THD both channels driven @ 1kHz. Rated Watts 2ch x 4 ohms 2800 watts 20ms repetitive burst / 2450 watts 1% THD / 2020 watts 0.15% THD, both channels driven @ 1kHz. Rated Watts 2ch x 8 ohms 1550 watts 20ms repetitive burst / 1425 watts 1% THD / 1200 watts 0.15% THD, both channels driven @ 1kHz.